← What is an Amateur? 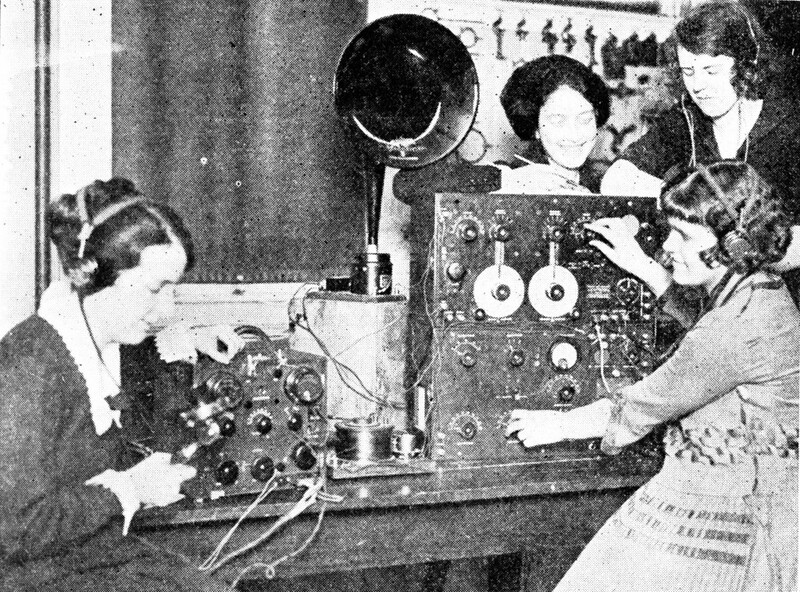 Despite several attempts, no successor to the outdated 1912 radio law had yet emerged. Now it could wait no longer since things had changed so radically with the rise of broadcasting—“well over a half-million receiving stations in the country, some sixty broadcasting stations, and rumor has it that there are some five hundred applications for broadcasting pending in the department of Commerce,” wrote Warner.1 Companies were trying to control access to the airwaves too; AT&T, for example, was formally requesting a monopoly on broadcasting. In early March, 1922, Secretary of Commerce Herbert Hoover convened the first National Radio Conference in Washington. In assembling the conference committee, Hoover had chosen thirteen individuals prominent in radio but ostensibly independent of any particular interest group. It included a senator and a congressman, Stratton, the director of the Bureau of Standards, Hazeltine of Stevens Institute of Technology, Jansky of the University of Minnesota, Armstrong of Columbia University, Goldsmith, secretary of the IRE, several from other departments of the government, and Hiram Percy Maxim of the ARRL. The conference committee was then termed a commission whose job, beyond organizing the conference, would be to recommend changes to the 1912 law and draft an amendment on behalf of the Department of Commerce. During two days of open session the conference heard views from the various interest groups present. Then, in closed executive session, three committees were formed—Legal, Technical, and Amateur. Maxim would chair the amateur committee and have Armstrong and Hazletine as members. “The hearings were funny,” remarked Warner. The prevailing sense was that the corporations were in a power grab, conspiring to create a group monopoly yet not selling equipment to competitors, all the while producing inferior receivers. This caused the hearings to take on the mood “of a Congressional Board of Inquiry” grilling the commercial broadcasting firms. AT&T wanted to sell what it termed toll broadcasting, the progenitor of commercial broadcasting where programs are interspersed with advertisements paid for by sponsoring companies. Under a government-sanctioned agreement to merge patent rights with General Electric, AT&T clamed to hold the rights to “all commercial applications of the radiophone.” GE had similar rights to the amateur phone business and all radiotelegraphy. Other companies’ access to licensed equipment was then considered in combination with these two. For example, RCA and Westinghouse would be allowed in with GE, and Western Electric with AT&T. Thus, for example, radio manufacturers GE and Westinghouse were cross-licensed with RCA, who could only sell those two brands of receivers. Edwards of GE suggested commercial broadcasts should only occur during daylight and entertainment in evening (implying that he considered entertainment not to be commercial). Various suggestions for wavelength allocations were made by the companies’ representatives. Some voiced support for protecting amateurs. But in order of importance, Elwell of RCA ranked the services as: government, civil departments, maritime, educational, entertainment, amateur, public service. On day two, the amateurs’ viewpoint was heard, presented by an ARRL delegation consisting of Paul Godley, ARRL VP Charles Stewart, and Secretary Kenneth Warner. Godley pressed the need for wavelength allocation and rightly (and with credibility as a receiver expert) blamed at least some of the interference problems on the inferior quality of the receivers being produced by the commercial firms. 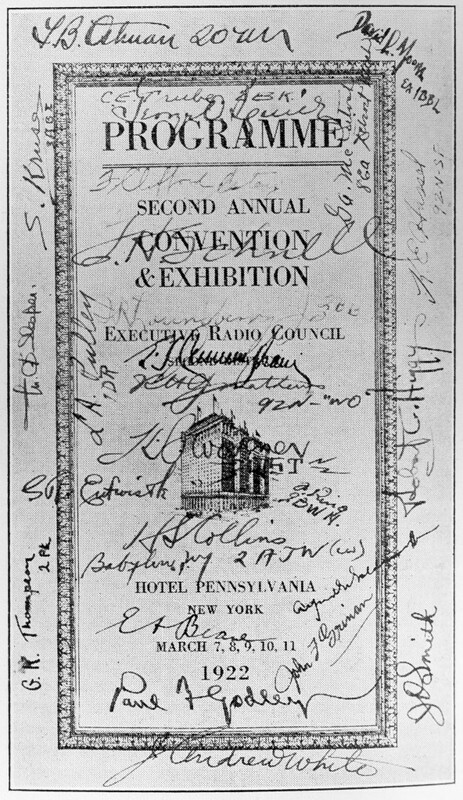 Recent publicity, portraying amateurs as “the American small boy” and something to be curtailed, was quashed by Secretary Hoover himself in a strongly worded statement that “the whole sense of this conference has been to protect and encourage the amateur in every possible direction.” Stewart and Warner recommended moving broadcasts above 1,000 meters. Several small companies testified too, some of which had representatives who were also amateurs. Other interests were heard from including public services, the Boy Scouts, the US Shipping board, and the Philadelphia police. Warner was permitted to sit in on the confidential executive session as advisor to Maxim. The basic plan was to propose amending the 1912 law to designate the Department of Commerce as the main regulatory body, and the conference commission was to outline guiding principles for its actions. Public—material of general interest such as informational, educational, weather, etc. Allocations were proposed: Below 150 meters was designated reserved; 150 to 275 for amateur use; 275 to 1,050 for various utility services; 310 to 435 for private and toll broadcasting; 310 for restricted special amateur telegraphy (in sparsely populated areas only); 1,050 to 1,500 for Government and public broadcasting; 5,000 to 6,000 for transoceanic telephony. The commission’s amateur allocation from 150 to 275 meters allowed spark, MCW, phone, and straight CW in segments from shortest to longest wavelength—once again, a model similar to today’s band plans. On one hand, pushing up to 275 meters seemed good but they had also introduced a lower limit at 150 meters that did not exist before. What could amateurs infer from that? It was troubling. The status of the amateur would be established by law within an allocated band, with smaller bands for the various modes in the order: spark, interrupted or modulated continuous wave telegraphy, telephony, continuous wave telegraphy. And to promote self-policing, positions for Deputy Radio Inspectors would be created, elected by the amateurs, serving without compensation or for the sum of one dollar per year if compensation is legally required, to accomplish the observance of laws and regulations and observance of co-operative measures for the minimization of interference. Amateurs did not get all broadcasting pushed up above 1,000 meters as suggested because there just was not enough bandwidth up there—more stations could fit in the 310–435 range than the 1,050–1,500 segment which could only accommodate twelve stations at 10 kc width. The most important provision was the recognition of amateurs as one of the classes to always be established. The proposed allocation would help improve conditions for the estimated 15,000 stations. At a District Radio Convention, Chief Radio Inspector Terrell of the Department of Commerce recognized that the League would have a representative on the Secretary’s committee on new rules. That would be the channel through which all amateurs could express their views and influence the committee’s conclusions and recommendations, and he encouraged them to do so.2 He remarked that “there is at present, and I hope there always will be, just one amateur radio organization of the amateurs, by the amateurs, and for the amateurs.”3 He reported a total of 14,179 licensed amateur radio stations in the US, with the largest number, 2,664, in the ninth district, and the first, eighth and second close behind with more than 2,000 each. This was an increase of about 4,000 in just the last eight months. He believed it necessary to note that this did not include receiving stations whose number he could not begin to estimate. But he observed that “broadcasting promises to become one of the most valuable functions of radio” if it could provide the public with what they wanted to hear. He predicted that reallocation of segments would be necessary and that hams would have to forfeit their 375-meter segment for experimental use to allow for broadcasting expansion. Since hams had gotten across the Atlantic on 200 meters, he reasoned, they should be willing to relinquish 375 meters “unless [hams] contemplate a test with China,” still perpetuating the notion that the longer wavelengths were best for DX. A suggestion that the government might print monthly lists of new amateur stations was met with wild applause by the convention. At another District Convention in New York, David Sarnoff, Commercial Manager of RCA, speaking to an overflow dinner crowd, noted that if one were to take into account actual accomplishments, many amateurs were more like commercials (meaning professionals) whereas many commercials were amateurs.4 It was meant as a compliment. Bewilderment pervaded the talk in amateur circles as they greeted the explosion of broadcast radio with a mixture of pride and sorrow, as ARRL Secretary Warner put it.5 Once the companies got going after the war, “everybody promptly went bugs on wireless,” he wrote, causing a huge demand for receivers which could not be met despite the start-up of new companies and increased production. He compared it to the Texas oil rush. Many hams had left to become part of the commercial radio world. Other media was jumping on the radio bandwagon. New radio magazines appeared and newspapers now had radio columns that sometimes were written by writers posing as experts who, in Warner’s estimation “simply ain’t.” “The movies are full of it” too, claimed the editor, evidently referring to radio appearing prominently in films of the time. Advertisers “dump great piles of radio pictures upon us, many of which are decorated with feminine legs, always a sign of popular interest.” As if to validate the point, QST then printed one such photo in its Radiophone column that month, showing a picture of four students, labeled “college girls,” at Radcliffe operating a radiotelephone station.6 The 8ZZ cover drawing for April showed a young woman in an evening gown sitting in front of a receiver – no headphones, just a big loudspeaker – with a radio-wise gentleman in a tuxedo handling her chair while instructing her on the art of tuning. Although radio was permeating popular culture, not everyone in business was happy about it. Theaters reported a downturn in business that they attributed to people staying home to listen to radio. Record dealers were also complaining; they had not yet caught on to the vast new opportunity to promote their product. QST’s editor wondered what it would all mean for hams, asking “what’s going to happen to the old game and where will we be a year from now?” And hams still did not quite believe all of it, wondering if the radio broadcast boom wasn’t just a transient bubble, a fad of average people who would either lose interest or become hams. Nevertheless, QST predicted eventual stability in the market and the coming of broadcast regulation. In the end, amateur radio by definition could not be commercialized—at least not on the air. There was also some debate about the purpose of QST in the light of all the interest in broadcasts, and whether or not to expand its scope to encompass broadcast listening. 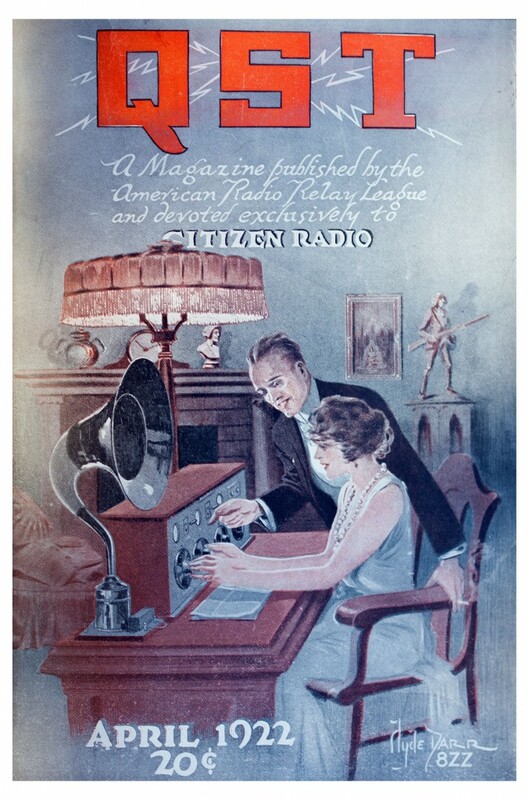 By June 1922 the League decided that QST would remain purely a magazine for “the practical amateur.” The listeners, whom they called “new radio folks,” were not really amateurs but more like radio fans. Nevertheless, some of them might become amateurs and QST’s role was to be there as a source of information when they became interested. Meanwhile, the overall amateur ranks continued to grow, and QST’s circulation stood at fifty thousand in the spring of 1922. The June issue had 148 pages including covers, 80 of which were ads. The Calls Heard section was now up to seven pages. March QST was the first issue in which no ads for spark gaps appeared at all. And in the May Strays column, an item read, “Wouldn’t it be wonderful … if Henry Ford would buy up all the spark transmitters in the second district and use them for ship moorings?” Perhaps this hinted at the first use of the term boat anchor as a derogatory reference to obsolete equipment, long before it took on the gentler, nostalgic meaning it has today. Whatever it was, the air was filling up fast.